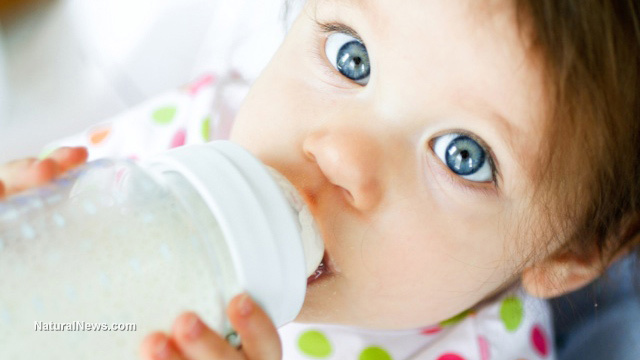 A petition is circulating to persuade three of the top infant formula brands in the U.S. -- Abbott Laboratories (Similac), Mead Johnson Nutrition (Enfamil) and Nestle (Gerber Good Start) -- to stop using genetically modified (GM) ingredients in their baby products. Each of these powdered formulas is loaded with corn and soy byproducts, along with sugar, which means they are more than likely GM in nature and harming children. Several years ago, Natural News warned our readers about these dangerous food products for infants, focusing specifically on Similac's "Go & Grow" formula. The product, which is marketed for babies aged 9 to 24 months, claims it contains "balanced nutrition for older babies." But as we pointed out, the product is nearly half composed of corn syrup solids (sugar), with the remaining 50-or-so percent composed of soybean oil, soy protein isolate, safflower oil and more sugar in the form of sucrose. Besides being an absolutely unhealthy product in general, based on these ingredients, Similac Go & Grow is an utter freak show of GM additives, which are particularly harmful for developing children. GMOs have been linked to hormone disruption, gut damage and other problems that, again, especially in children, can lead to a lifetime of chronic health problems. But Similac isn't alone -- practically every major brand of commercial infant formula is composed mostly of corn, soy, and sugar components, each of which is more than likely GM due to the fact that upwards of 90 percent of corn, soy and sugar beet crops planted in the U.S. are GMOs. "For the infant that is unable to nurse I insist upon an organic commercial formula," stated pediatrician Michelle Perro, warning against commercial, GMO-laden infant formulas. "Because of the toxic effects of herbicides, particularly glyphosate (due to its prolific usage) as well as other organophosphates and genetically engineered foods in non-organic commercial formulas, these are not an option for infant feeding. In order to ensure the health of our infants and children, there is no amount of acceptable herbicide or GMO that should be in their diets." Beyond just poisoning our children, Abbott, Mead Johnson and Nestle all want to keep this poisoning a secret. As explained by GMOInside.org, each of these companies spent big bucks fighting California's GMO labeling initiative, Proposition 37, which would have required that infant formulas contain warnings about GMO content. Abbott reportedly spent $334,500 in support of the "No on 37" campaign, while Mead Johnson, which has a much smaller market share, spent $80,000. Nestle, an industry leader in commercial infant formula, contributed $1,461,600 to block Californians from knowing what's in their food. Combined, these three companies raked in about $135 billion in sales in 2012. "It's infuriating that parents in the United States are not given the same assurances as citizens in more than 60 other countries including China, Mexico, and Saudi Arabia, when it comes to GM ingredients," said Green America President Aliza Gravitz. "All parents have a right to healthy food options for their children." A Green America petition calls on these Big Three infant formula manufacturers to stop using GMOs, which have never been proven safe for human consumption. The long-term effects of GMOs in humans have never been studied, and because babies' bodies are already less equipped to deal with processing toxins, it is only logical to stop feeding them untested genetic materials that could lead to permanent health damage.